One day I was doing my usual online browsing when I came across Urban Outfitters Studded Friendship Bracelet. I couldn't believe my eyes when I saw that they were trying to sell this bracelet for $14! I loved the idea of this bracelet but was not willing to drop $14 on it when I knew I could do it myself for much less (I already have the friendship bracelet floss)...so what did I do. Order some studs online and DIYed it! - Something to pin your bracelet to like a pillow...your jeans that you are wearing...whatever is easiet for you so that it doesn't move when making your bracelet. 2. Once you have your bracelet measured out tie the ends and cut the extra floss off...leave enough tail behind to be able to tie it around your wrist. 3. Before pushing your studs through figure out where you want to place them. 4. Once you figured out your placement start studding! Remember to push the backs in if you are using push pin ones. VIOLA! You have a studded friendship bracelet. Just an FYI this is probably something that won't take you one day to do unless you really sit down and do it OR have fast fingers. 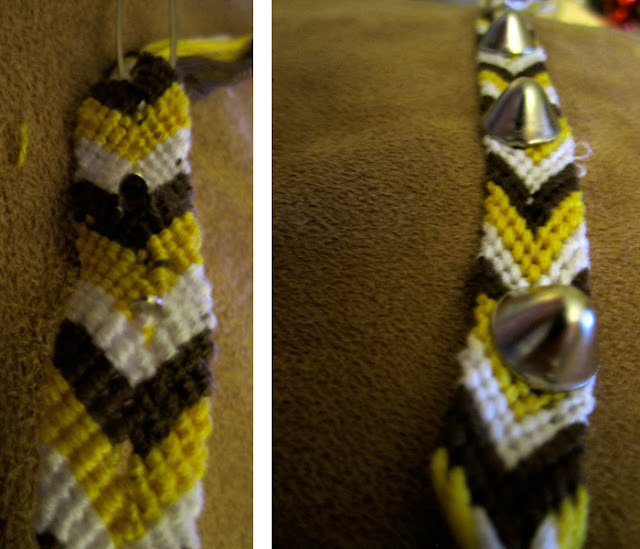 Making friendship bracelets is a great project to do while traveling, that's for sure! What do you guys think of this DIY? Are you going to give it a try? Great DIY! Also love the ring on your right hand! Such a cool idea! Love the colors of the bracelet too! You are rocking some gorgeous finger candy in these shots. Love the rings. Wow this is so cool! The most stylish DIY I've seen in a while! Very cool! I used to make these bracelets (without the studs) all the time! I LOVE the idea of adding studs. You are adorable! Love the date night outfit too! Thanks for visiting my blog! I just followed you on Bloglovin! Pretty. I really like this. So great when you find cool stuff that you know you can DIY for less. Seriously, Urban Outfitters charges sooo much for things that cost so little to make! Yours looks so good. ps--I am hosting a lovely giveaway, feel free to stop by! This would be so fun to do with a bunch of friends! I'm having a girls night this weekend...we might have to try this! aw this post is really interesting!! I've always wanted to know how to do this, so thank you so much for sharing!